The following examples will demonstrate the use of "for" looping construction to iterate over files with a particular pattern. 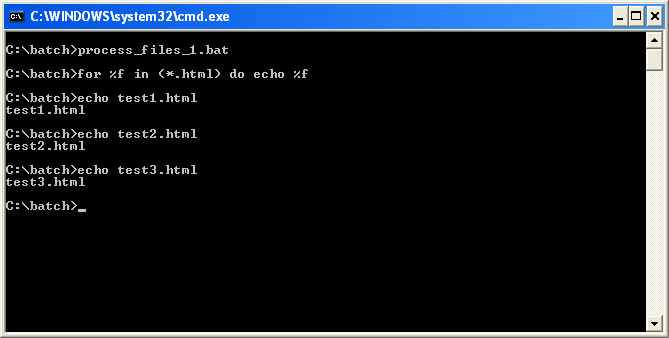 Problem : We want to create a batch file to echo each .html files only. Create a batch script named "process_files_1.bat". The script will iterate over a pattern with "*.html" as part of the nameset in our batch script. The complete batch script code shown below. The result shown in the screenshot below. 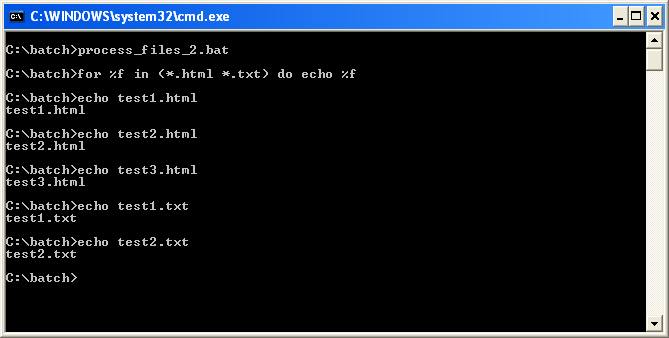 Problem : We want to create a batch file to echo each .html and .txt files. Create a batch script named "process_files_2.bat". The script will iterate over a pattern with "*.html *.txt" as part of the nameset in our batch script. The complete batch script code shown below.